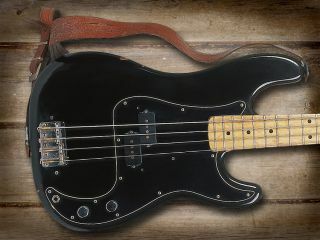 Like many famous bass players Roger Waters has owned and used many bass guitars over the years. In the early days of Pink Floyd he could be seen wielding a Fireglo Rickenbacker 4001S but since then his obvious preference has been for the trusty Fender Precision, of which he's used several. Our picture shows one of the most significant of these as it's the one used for many Floyd albums and significantly The Dark Side Of The Moon sessions. One of a pair bought around 1971, this is serial number 347485 and was played by Roger and David Gilmour and sports the usual gig scars and cigarette burns to the headstock as befell many an instrument of the time. The Dark Side album was recorded in two major sections in 1972 and '73 at Abbey Road Studios. It was engineered by Alan Parsons who played a major part in the overall sound of an album that went on to become one of the best selling of all time. In America it topped the charts in 1973 and remained in the album charts until 1988 making it the longest charting album ever. Roger was a major force during this period, being something of a musical director with the band and his input on the album was significant. Although not a flamboyant player by any means, his bass work and sound has always been very solid throughout as demonstrated on the self penned Money. With all but the guitar solo set in 7/4 time the dominant riff was almost certainly written on the bass and neatly showed that you could produce a groove in something other than regular 4/4. Recorded way before click tracks became standard, the track gradually speeds up from start to finish but this natural adrenaline boost was common at the time and most players will experience it when performing such a powerful track live. Roger is predominantly a pick player and used Rotosound flatwound strings on this. As we can see there's nothing special about the bass, although the all black body and scratchplate with an all maple neck was an unusual combination at the time. Fender recently brought out a Roger Waters Signature Edition which carries the black theme to the extreme with a single ply scratchplate, black anodised bridge and even black strap buttons. It also features a brass nut and a Seymour Duncan Basslines SPB-3 Quarter-Pound split-coil pickup so has a few rather nice features . Visually (apart from the controls) the Squier Freeman P-Bass is a closer representation with a three ply scratchplate but now perhaps we're getting picky! When Roger left the Floyd he took that other bass with him. This one stayed with the band and Guy Pratt used it for two tracks on The Division Bell album, Coming Back To Life and Take It Back.